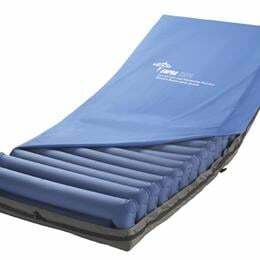 Supra Dps Low-Air-Loss Mattress: Alternating-Pressure, Low-Air-Loss Therapy Mattresses Are A Critical Component In Your Battle To Help Prevent Pressure Ulcers. Medline'S State-Of-The-Art Supra Dps Mattress Is An Affordable, Virtually Maintenance-Free Choice. It Features A Digital Pump And Advanced Technology. This Innovative Specialty Air Support Surface Features: Alternating Pressure/Low Air Loss/Static Float/Auto Firm/Seat Inflation. Choice Of Four Alternating Pressure Cycle Times. Upgraded Low-Friction, Anti-Shear Stretch Cover. Cell-On-Cell Mattress Design Prevents "Bottoming Out". Stays Inflated During Power Outages. Quick Connector Allows For Easy Setup And Keeps Mattress Inflated During Transport400Lb. Weight Capacity Supra Dps Powered Low Air Loss Mattress.